The New Year is here, and while I trust it will grace your life with much of what you’ve striven toward, it’s sure to also bring some sort of adversity. After all, none of are immune from the curve balls that life throws us, from the frustrating but mundane like your vehicle breaking down, to the much more harrowing like an ended relationship, job loss, or illness. We don’t like to think about it, but, again, none of us are immune from life’s curve balls, adversity coming our way. I’ve spent my entire life facing adversity – from my disability at birth to my troubled family growing up to challenges in my adult life – and among my most valuable assets have been the friendships I’ve evolved over decades with others who’ve successfully faced adversity. And, between the two, I’ve developed a learned skill set that’s consistently helped me move from surviving to thriving at many points in my life. Yes, adversity will surely come my way again, too – it’s inevitable – but I’m ready. For me, addressing adversity has become intuitive, springing into positive action when it occurs. I understand several core principles that have served me and others so well in times of adversity, where I believe they can serve all of us, no matter the circumstance. When we face adversity, it’s easy and natural to focus on what’s happened to us. …I lost my job. …My marriage is over. …I’ve been diagnosed with an illness. However, in most cases, it’s futile and moot to focus on what’s happened to us. Sure it’s healthy to process emotions, but in the larger scope, we need to look forward toward opportunity – and, there’s always opportunity in adversity. As W. Mitchell – burned over 90 percent of his body, then later paralyzed – has told me for 20 years, It’s not what happens to you, it’s what you do about it. Therefore, when I face adversity, I’m always immediately seeking the opportunity in it. I don’t always make a smooth transfer into my wheelchair, sometimes landing on the floor. Yet, I’m never frustrated by the fall – it’s over, done, who cares. What I’m solely focused on is getting up, as that’s where the opportunity resides. My sister was also an amazing example in this. At 23, she had cancer and was in a bad marriage. She didn’t drift into self-pity, but focused on beating cancer and used it as a life-affirming catalyst to leave an unhealthy marriage, going on to a life closer to her dreams. Cancer for her wasn’t a tragedy; rather, it was a catalyst. If you lose your job, it’s an opportunity to find a better one; if your relationship ends, it’s an opportunity to find the partner of your dreams; if you have illness, it’s an opportunity to gain new life perspectives. We all get knocked down in life, but the wise among us only care about getting up stronger. Have you ever noticed that we have a way of allowing adversity to have a domino effect in our lives? Think about how many struggle at work, then go home to take it out on their families. The examples go on and on, where when one aspect goes astray, we let it ripple through our entire lives, being far more devastating than it should. 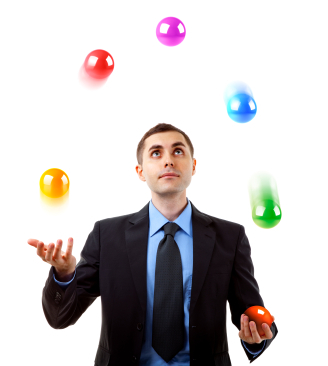 A college buddy of mine is a juggler, and he taught me that as a juggler, if you drop a ball, you keep juggling the rest because whether you juggle four balls or three, the audience is still entertained – just don’t stop juggling! Life is like that, as when one part of your life goes wrong, don’t let it pull down the rest. Never let the bad sabotage the good. I’m the only one in my family to have ever graduated high school, and the way I did it was by refusing to let my nightmare home life effect my schooling. No matter how bad a night was at home, I still got up the next morning and went to school engaged. It doesn’t make sense to allow one area of dysfunction to void all other areas of prosperity. In fact, when one part of your life is astray, that’s the precise time to especially focus on the positive areas – and you’ll be amazed at how the negative soon turns around. When facing adversity, we have a peculiar way of embracing the blame game. I feel like this because of him. My life is like this because of what happened to me. However, we have far more control in the long run over our lives than any other person or circumstance can dictate. We can’t always control what happens, but we can totally control how it impacts our lives. We can choose at any point to be a victor or a victim. I may have been hurt in that relationship, but I grew from it and I’m more open to love than ever. Nick Vujicic could appear to many as a victim, having been born with no arms or legs. But, as Nick travels the globe speaking to hundreds of thousands each year – as an evangelist, author, husband and father – he lives by the unwavering philosophy, No arms, no legs, no worries, mate! We all possess the power to dictate what controls us. I don’t care what happens to me, I’m going to strive not to relinquish my fulfillment to an outside force – I will be victorious over adversity, not a victim. If we summarize these core strategies, a remarkable truth is seen: not only do we each intrinsically possess means to address adversity in healthy ways, but we can often minimize its impact and literally use it in our favor. And, so the theme for adversity in the New Year is simple: we are equipped, so bring it on!